In a nutshell: The Apple iPad Pro 12.9 inch pushes the capability of the iPad into new territory. 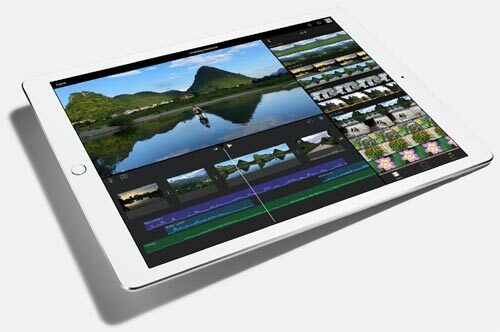 The Pro is significantly larger, faster and more powerful than other tablets, and comes close to the potential of a MacBook, especially with the addition of the optional Smart Keyboard. Priced competitively, the Pro offers a lightweight alternative to a laptop. The iPad Pro is a larger version of the iPad Air 2. Instead of a 9.7 inch screen, the Pro has an expansive 12.9 inch display. 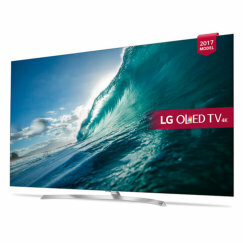 With an increased resolution of 2732 x 2048 pixels, it retains the very sharp 264ppi pixel density of the Air 2. It's a superbly detailed screen, with rich colours, good contrast, high visibility, and is super responsive to the touch. We're really quite blown away by the size and quality of the screen. We'd go as far to say that once you've spent some quality time with the iPad Pro, a smaller tablet just won't cut it any more. You can easily imagine yourself in some kind of sci-fi movie when handling this device, and we don't get that feeling too often. The Pro is slightly thicker than the Air 2, but at just under 7mm, it's hardly a problem. The weight of the tablet has increased quite considerably however, by about 65% to 713g for the Wi-Fi version and 723g for the 4G version. The increase in weight is less than the increase in screen size, so the device doesn't feel heavy to handle, but it's obviously less portable. The build quality of the device is impeccable as you'd expect from Apple. The home button includes the usual fingerprint identity sensor, which can be used to unlock the device and to authenticate Apple Pay and purchases from iTunes and the App Store. There are 4 speakers built into the unibody, significantly enhancing audio quality. The Pro comes in a choice of Silver, Gold or Space Gray, and with matching covers too. A Smart Keyboard cover will be available for the device, although this is in scarce supply at launch. An optional Apple Pencil is also available as an optional extra. 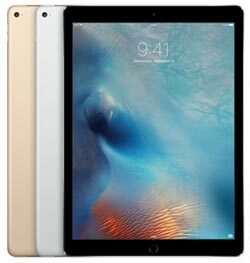 The iPad Air 2 was already very fast by tablet standards, and the Pro pushes performance higher, replacing the A8X processor and M8 coprocessor with the new A9X and A9 processors. The RAM has also been doubled from 2GB to 4GB, giving a significant performance boost. The overall effect is to make the Pro nearly twice as fast as the Air 2 for both graphics and general processing. So as well as playing games, the Pro is, as its name suggests, the kind of device that you can use for some serious computing. It's even capable of editing 4K videos. To support this, the starting memory has been doubled to 32GB, and it's also available in a 128GB version, which is our preferred option, especially as there is no memory expansion slot. The Pro runs ioS 9, and will be fully upgradeable when a new version of iOS is released. iOS 9 supports limited multitasking, allowing you to run two apps side-by-side. Apple has made no changes to the front- or rear-facing cameras. The rear-facing camera has an 8 megapixel BSI sensor. It's an impressive camera with autofocus and HDR mode, but a tablet this large isn't the ideal device for taking a lot of photos. Video recording is limited to 1080p, rather than the 4K video available on the iPhone 6s. More useful is the front-facing 1.2 megapixel camera, which also has a HDR mode, and can record 720p video. 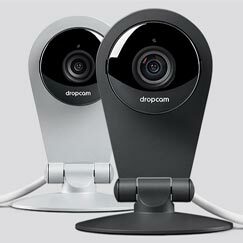 FaceTime video chat is the obvious application for this camera. As already mentioned, the iPad Pro comes in a choice of Wi-Fi-only and Wi-Fi plus 4G versions. The latter includes 4G LTE compatibility plus 3G in addition to Wi-Fi, and makes you fully mobile. It's the same size and weighs just 10g more, but costs more to buy and that's before you factor in 4G data costs. Other connectivity includes Bluetooth 4.2, a Lightning connector and a 3.5mm stereo headphone jack. You'll also find a Smart Connector for connecting to the Smart Keyboard. The battery life of the Pro is a match for the iPad Air 2, at around 10 hours of continuous use. Be aware that recharging can take as long as 5 hours. Before we conclude, we should talk about pricing. 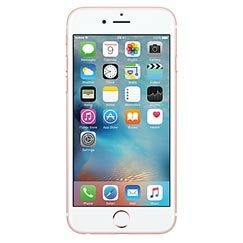 The Wi-Fi-only versions cost £679 for the 32GB model and £799 for the 128GB model. 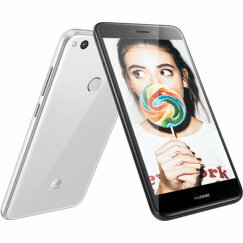 The 4G 128GB model is priced at £899. That's a lot of money to spend on a tablet, but for once we think Apple has got the pricing correct. Certainly the Pro has a lot more power than the iPad Air 2. Its screen is 75% bigger, it's twice as fast, with double the memory. Once you've used the Pro, you'll be loathe to return to a smaller tablet. The expanded screen and extra power makes the Pro a significantly more capable device, capable of running serious apps, and, dare we say it, replace a MacBook. It's more portable, has a screen that's 12.9 inches compared with the 13.3 inches of a MacBook Air, and is of higher resolution. The price of the two devices is very similar. Of course, the iPad Pro runs iOS, not OS X, so it can't run the full range of software. but for many users this won't be an issue. The Pro is pushing into new and interesting territory, and will be a superb device for many users. I've been on somewhat of a tech mission the last few months but I've ended up in a place where I never thought I would be for sure.... With an Apple iPad pro. First things first, I hate iPhones!..... I think they are over priced and over rated and there are many cheaper options that to my mind do a better job. However I've always enjoyed using my iPad mini. Of late I've switched to a fire hd 10 with play store side loaded. For work I first used a surface 2 and then the pro 4. Don't get me wrong, the pro 4 is great and works well but I've always found windows somewhat of a mission to use. Then there's the inconsistency of windows mobile. I just don't find Windows 10 that fluid to use. 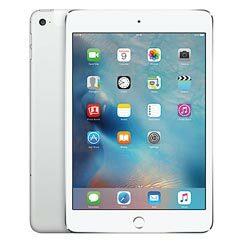 It got me to thinking about the iPad mini I had and how easy it was to do what I wanted within reason. Off I popped to one of the big chains and...... BANG!!!!!! It was like riding a bike. Very impressed indeed. Its probably a personal thing over Windows but for what I use a tablet for, Apple just makes more sense. It just works on the button. Movies are outstanding. Work flow is smooth and easy. Sound is great. Don't use the camera really but that's good too. Having the App Store is fantastic. I absolutely love creating on it. It's great for the family to sit around and play games together and such. Great for kids learning. It's a strange thing but on the keyboard I don't miss the trackpad. If it was the pro 4 then I would for sure. I only have one real gripe and it's minor and nothing to do with iPad pro itself. It's the pen. Why no eraser. Absolutely baffles me. As a result I use the pro 4 hardly at all now. I don't often say this about Apple products, but I think the iPad pro is worth every penny and has the potential to surpace surface for office use simply from ease of use. For all the people that bashed the pro on release........ Try one. It's the best iPad ever!